Ack! Sorry for the unplanned blog silence. I had intended to take a week off after completing the $100 One Room Challenge but one week accidently turned into two. Actually I have been quite busy with tons of yard work (trimming trees, planting, spreading a truck load of mulch, and clearing and making new beds), organizing a neighborhood yard sale and then participating myself for 2 days, and other projects. I am desperate to get the major yardwork we need to complete this year done quickly this spring before temps here get in the 90’s – baby + mommy + hours upon hours of yardwork in 90 degree heat is just not going to be fun. I think I am about halfway done with what we hope to accomplish but there is already 88 degrees in the forecast for this week- we don’t get a long spring here in the south. I hope to get it all pretty much wrapped up by the end of April and then I’ll do some yard and outdoor project post updates to show you progress. The yard and outdoors at this house are going to take several years to actually look good but at least we are making progress! So while I was having my 2 day yard sale I tried to think of some projects I could do in between customers. 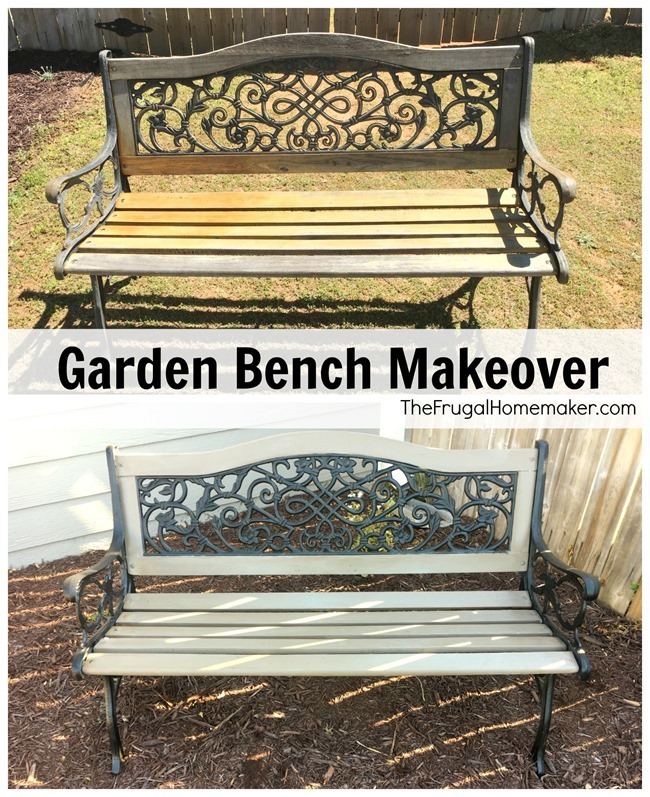 I spray painted a few things and then decided I would give this garden bench a needed makeover. 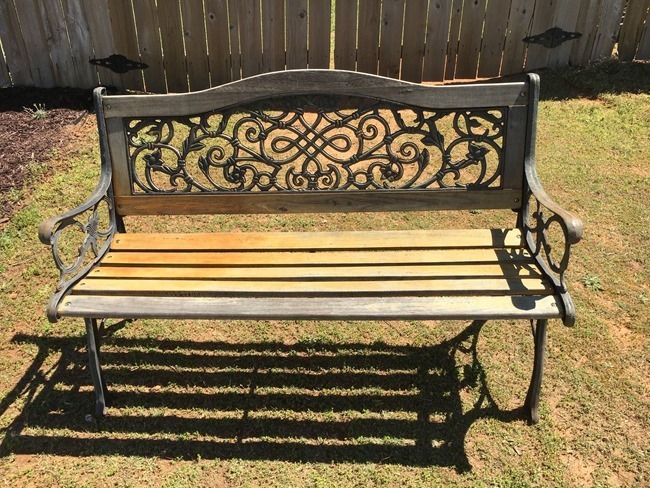 I purchased this bench 6-7 years ago at Home Depot and it sat on our porch at our previous house. I had restained the wood one time but it just didn’t hold up to the weather well. And now the wrought iron part of it was rusty and weathered too. I debated taking it all apart so I could spray paint the legs and the back part but the screws were rusty and hard to remove so that plan went out the window. 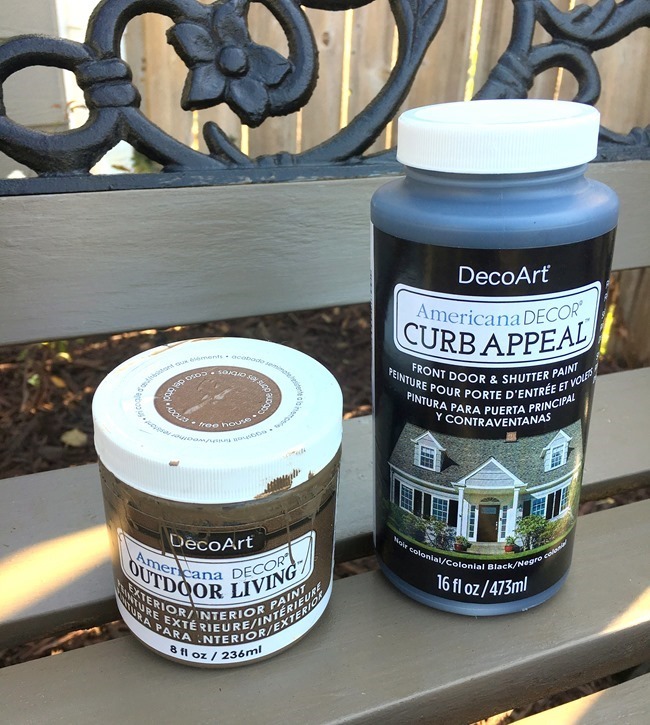 My partnership with DecoArt is over but I still have lots of leftover paint and products and lots of projects where I can put them to use! So I grabbed the black Americana Decor Curb Appeal paint that I used on my front door and shutters and painted all of the wrought iron with it. For the wood portion I opted to just paint it instead of stain it. I used some brown Outdoor Living paint (color is called Tree House) and painted all of the wood parts of the bench. And here’s the after! 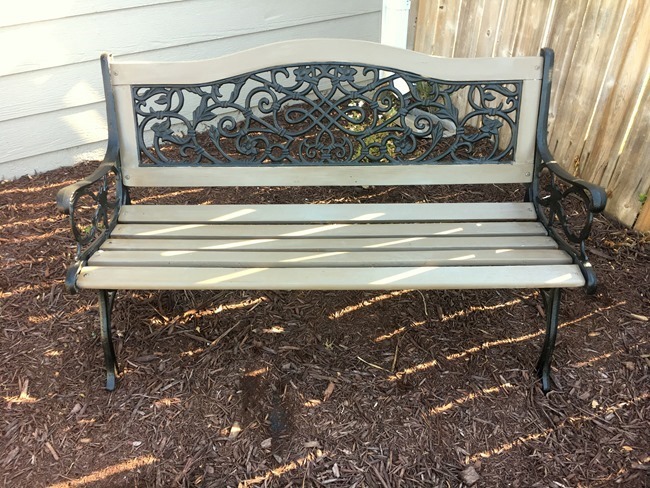 The black wrought iron looks all fresh and shiny and new and the bench portion no longer looks weathered and worn. For now I have it over in this garden bed in the corner but we may move it after we finish more yard work. One more project off the list! What projects have you been working on this spring? Hi Christina, It looks great! 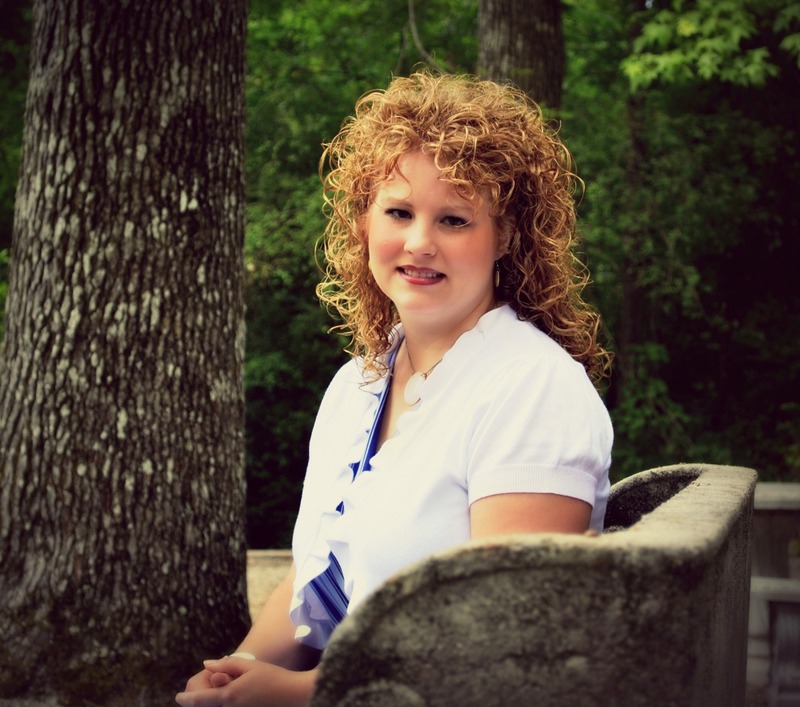 I ‘m so happy to read your post today as I was concerned that maybe you or your baby was Sick! Trying to renovate a yard is a lot of hard work, ask me how I know!!?? I have been digging grass out of a neglected flower bed, it is looking alot better. 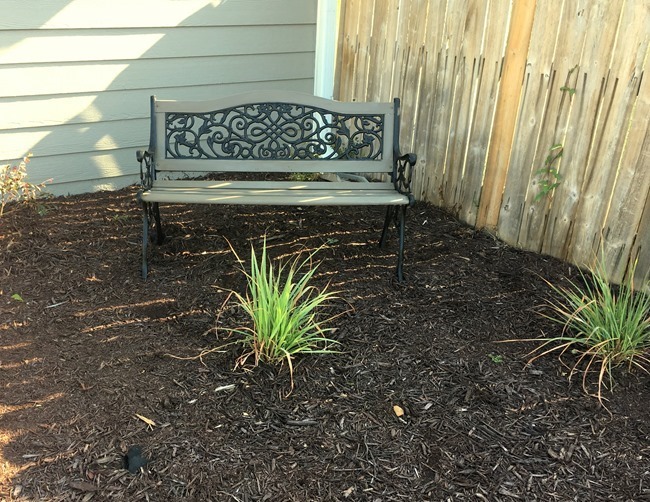 I enjoyed reading about your bench, it looks so fresh and pretty now! You did a great job! Looks so refreshed!!! I am glad that I read about the garden bench. I have one and did not know how to restore it. My boards are rotten. I will repaint the metal with the materials in your project. I will buy New pressure treated boards for seating area.